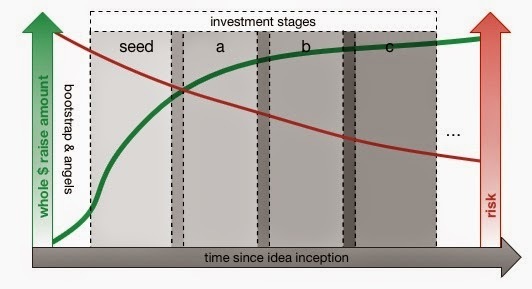 With so much startup investment activity these days, I find myself in regular discussion around valuations, stages of investment (and what those stages mean), and, from the entrepreneur’s perspective, when to engage various forms of investment. I’m a visual thinker, so I pulled some charts together that help me think about this stuff, and hopefully you’ll get some use out of them too. The front of this post lays some groundwork, then I’ll briefly walk through each of the three charts. In the end, hopefully you have a framework in which to think about your venture and how investment works around it. Of course, there are a ton of factors layered in here that I’m not covering or just glancing past. Of course, your mileage will vary. Bootstrap - You’re funding things yourself and/or with money from friends/family. Angels - Individuals writing checks to you out of their own bank account. 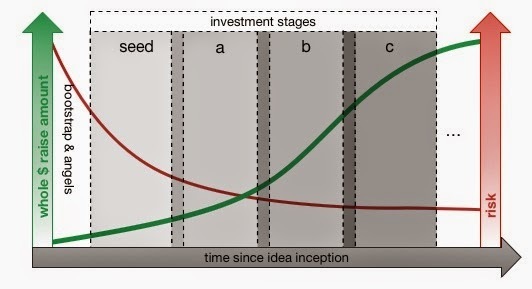 Seed - First reasonably sized investment chunk. it could be from several parties/firms, or just one. This is generally the earliest stage a venture capital firm or institutional investor will engage. a, b, c, … - These are more formal/clear investment rounds from venture firms or institutional investors. Entrepreneurs start things, and sometimes they’re willing to bootstrap them with they’re own money. In the beginning, we have entrepreneurs and sometimes their money. Whether we’re in high, or low, inflation environments often dictates whether an entrepreneur is required to use their own money. Venture Capital firms exist to invest and make money. Their motivation and purpose is simple and clear. When/where they invest, and on what terms and under what circumstances are highly variable though, but their motivation should always be clear to you; money. A good VC firm is armed with partners who have experience, steady hands, and a clear/concise investment thesis that they don’t ever deviate too far from (unless something catastrophic happens in the market place of course). This is where we are at the moment. Investors have to put higher whole dollar amounts of money into a startup, when things are higher risk than they’d generally like to. They have to do this in order to compete against other investors for business (pieces of the equity pie that an entrepreneur creates). Not only do investors have to put higher whole dollar amounts on the table in a high inflation market, but they often have to do so for a smaller percentage of the company. Note, I don’t layer in the all-important ownership percentages in here. I should, but I wanted this to be somewhat legible. Maybe next time. If you’re an entrepreneur, you don’t want to be raising money in this kind of market. Investors are less willing to put a lot of money into a high-risk initiative. They have plenty of money to spend, but they’ll only write bigger checks when more of the risk is minimized. They’ll also likely take bigger percentage stakes earlier on. This is really just the blend of the high and the low inflation markets. It’s the overall average of the markets over time.